It's that time of year - oodles of graduations and weddings each week. So it begs the question, where should one go after a ceremony or which caterer should one choose? 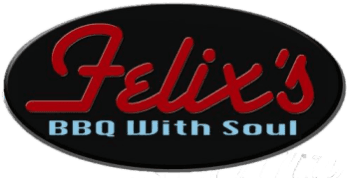 Well, on a sunny afternoon following a graduation ceremony, a journey to Southeast San Diego to enjoy some soul food was well worth the trip and answered these questions: and the answer is...Felix's: BBQ with Soul. Soul Food, for the uninformed, is the food made popular by African-Americans in the South. Felix's, a landmark already in just its first year, offered a special and authentic array of delicious soul food. For instance, chitterlings or ' Chittlins ' are offered and so are hoppin' john. Chittlins are a dish made of pork small intestines and hoppin' johns are seasoned black-eyed peas with rice. Anyone looking for an introduction into soul food or an old-time fan of the fare would be happy with the assortments available to eat at Felix's. At Felix's, each meal is accompanied by moist and sweet cornbread muffins with butter. For the entre, an order of the BBQ rib tips with fries and collard greens was chosen for this trip. The staple item, French fries, were a pleasure and the collard greens tasted like a homemade batch - tangy with a hint of spiciness. The main course, BBQ rib tips, were enjoyable as well. The flavor profile of the sauce was robust and slightly sweet. The pork was tender and cooked to perfection. With ample helpings of these expertly prepared dishes, one can gladly say that this meal, as they say, 'hits the spot.' Samplings of the fried chicken wings and fried green tomatoes from a fellow visitor were delicious as well. The fried chicken had a thin layer of batter and the tomatoes were tangy and enjoyable. Furthermore, the ambience was fitting for a special get-together. The spacious establishment allows for large parties and the down-to-earth serving staff is welcoming and gracious. Felix's is found in a small strip mall, nestled between several other restaurants. As well, the location offers plenty of nearby parking. Felix's is recommended for breakfast, lunch, dinner or your catered event. In fact, breakfast is offered until 2pm for the late starter. Felix's is closed on Mondays, however, there is an open mic night on Tuesdays at the San Diego location and it's open every other day of the week. Felix's restaurants are located at 342 Euclid Avenue, San Diego, California and at 3613 Ocean Ranch Blvd., Oceanside, California. Enjoy your meal! Talk about great food! And to complement, a great experience too. My boyfriend and I stopped here for a quick bite to eat, and we were served quickly and our server always came to our table with a great attitude. I looked around and saw the other guests getting the same service from other waitresses. As we were waiting for our food, there was a man sitting at the table next to us wearing a Felix's shirt; it appeared he was on his lunch. After he was finished he asked us how everything was and began making small talk. We asked for his name, and it was Felix. It's great to know that the man himself cares about the guests and experiences his atmosphere first hand. And to add, their sweet tea is to die for! Service was very friendly. Portions were generous and matched the price, which was very reasonable. The complimentary corn bread was a nice touch, our toddler loved them! The Chicken & Waffles was a hit! Chicken was seasoned well and crispy on the outside and very tender on the inside. Highly recommend it!Service was very friendly. Portions were generous and matched the price, which was very reasonable. The complimentary corn bread was a nice touch, our toddler loved them! The Chicken & Waffles was a hit! Chicken was seasoned well and crispy on the outside and very tender on the inside. Highly recommend it!